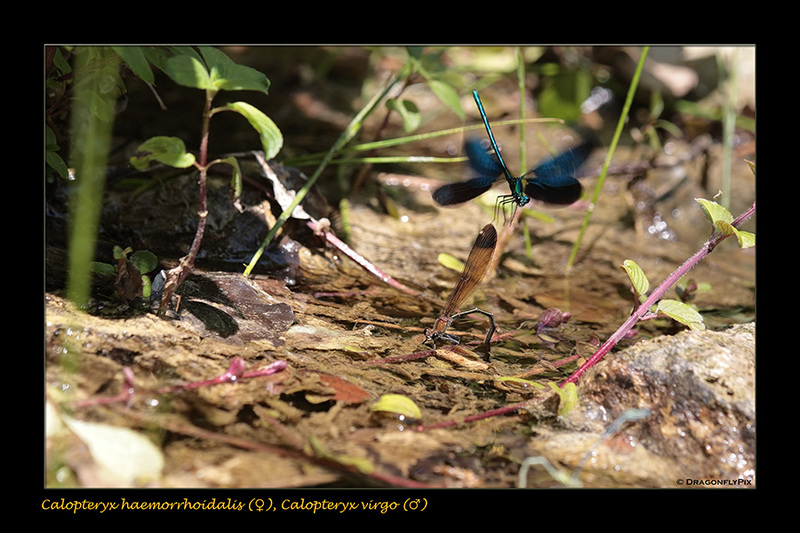 This photograph (made in Italy in July 2007) shows a male Beautiful Demoiselle (Calopteryx virgo) about to force himself on a female Copper Demoiselle (C. haemorrhoidalis). And the rest of our photos of this scene show that that is exactly what happened. Copulas involving members of two different species are of course a bit of a waste of time, but they're not as rare as you might expect. Our own (unscientific) explanation for this phenomenon lies partly in the very high population densities at some sites (in this case a small, shady mountain stream) and in the extremely high levels of competition for mates - in such conditions some males will grab a female (any female, really) first and ask questions later.